Did You Know? It is our policy to provide persons with disabilities an equal opportunity to participate in and enjoy the benefits of our services, programs, and activities. In order for us to provide reasonable accommodations, we ask that you request the assistance needed by contacting Parks and Recreation at 1101 Poyntz Avenue in Manhattan, or call 785-587-2757 (TDD Kansas Relay Center at 800-766-3777). We are here to assist you in the registration (application) process as well. Essential eligibility requirements for each program are on file. Assistive devices are available upon request. Important Info! First-Come, First-Paid: Space is limited for most of the programs we offer, and registration is accepted on a first-come, first-paid basis. In some instances, a waiting list may be available. MPRD Scholarship Policy: Some of our programs qualify for scholarships. You must show proof of participation in the USD Free/Reduced Lunch program or qualification under Federal Income Availability Guidelines. Camp Refund Policy: Please see page 13 for specific details. Refund Policy for Activities Requiring Registration: Registrants will receive a full refund if we cancel the program, or we may be able to transfer you to another class. A full refund is granted if request to withdraw is received 1 week (7 days) before the class or event start date. A partial refund is issued when requested between 1 week and at least 48 hours before the start date. No refunds will be granted if the request is less than 48 hours in advance or if the participant fails to show. Participant withdrawals must be received during business hours. For specific policies, visit each programâ&#x20AC;&#x2122;s website. Please note: Some programs have age restrictions and birth dates are required for each participant. Phone numbers are required for staff to access your account and for emergency purposes. For assistance, please call 785-587-2757, or come to our offices, Monday through Friday, 8:00am-5:00pm, 1101 Poyntz Ave., in City Hall. 10:30-11:00am	May 3	Flint Hills Discovery Center Unique stories connecting kids with the culture and ecology of the Flint Hills. See page 15 for details! 8:00-10:00am	May 4 Flint Hills Discovery Center Explore the avian side of the Flint Hills during this exciting spring birding outing. See page 21 for details! 10:00am-5:00pm	May 11	Flint Hills Discovery Center Experience the culture of the Flint Hills at our annual festival! Join us for live music, food vendors, beer, wine, and tons of children’s activities. Regular admission rates apply. 9:30am-5:00pm	May 12	Sunset Zoo Mothers visit free with a paid child’s admission. 10:00-10:30am	May 24	Sunset Zoo Slither into reading with Sunset Zoo at the Manhattan Public Library. See page 15 for details! May 25- September 8	Flint Hills Discovery Center Discover the genius of Leonardo da Vinci through interactive art, science, and engineering. Regular admission rates apply. Memorial Day to Labor Day	Join Manhattan Parks & Rec along with Fort Riley MWR for a summer of fun in the sun! Pick up a passport and participate in one of the many summer activities or events listed; snap a photo and post to social media with the #MHKkids #FTRileykids or #101DaysofSummer hashtag. Bring your completed passport to the end-of-summer BBQ for a chance to win prizes! Beginning 7:00pm June 8	City Park Bring your chairs and blankets for a fun family movie night presented by Navy Federal Credit Union. Bounce houses, face painting, and concessions will be available for purchase. The fun begins at 7:00pm; movie is at sundown. 8:00am-1:00pm	June 1 Flint Hills Discovery Center Get behind the scenes access to Tuttle Creek dam, tower, and spillway from the Army Corps of Engineers. See page 21 for details! Beginning 5:30pm	June 1	Sunset Zoo An evening fundraiser in support of Sunset Zoo! Enjoy wine and food pairing stations throughout the park. 5:30pm VIP reception; 7:00pm general admission. Tickets go on sale Monday, April 22 at noon! Special zoo hours on this day for the event setup: 9:30am-4:00pm. 9:30am-5:00pm	June 16	Sunset Zoo Fathers visit free with a paid child’s admission. Nationwide Campout Day: June 22	The National Wildlife Federation’s Great American Campout™ is a summer-long celebration of camping! Camp in your backyard, parks, cabins, RVs, etc., and be a part of this nationwide event! Snap a selfie of your camping adventure and post to social media with the #MHKPRDcamping hashtag. For more information go to nwf.org/Great-American-Campout. 9:30am-5:00pm	June 2	Sunset Zoo All children visit free with a paid adult’s admission. 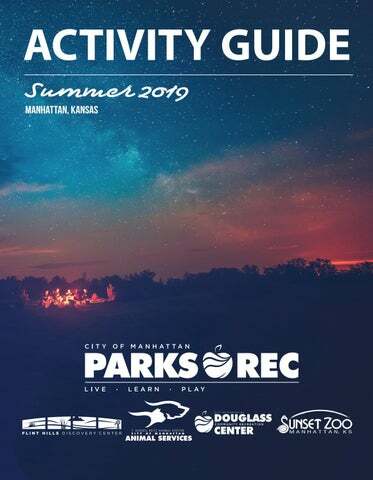 8:30am-1:30pm	June 22	Flint Hills Discovery Center See how Manhattan works with behind the scenes tours of the MHK Airport and water treatment facilities. See page 21 for details! 10:30-11:00am	June 7	Flint Hills Discovery Center Unique stories connecting kids with the culture and ecology of the Flint Hills. See page 15 for details! 8:30-10:30pm	June 7 & 8	Fairmont Park See and handle real spiders, then head out on a night walk with a headlamp to find, catch, and release wolf spiders! Preregistration is required. See page 21 for details! 10:00-10:30am	June 28	Manhattan Public Library Slither into reading with the Sunset Zoo and the Manhattan Public Library. See page 15 for details! 12:00-12:10pm	Fridays in June Blue Earth Plaza Pavilion Enjoy a 10-minute science demonstration from the Flint Hills Discovery Center education team while you picnic and splash! Free, offered every Friday, and registration is not required. 10:30-11:00am	July 5	Flint Hills Discovery Center Unique stories connecting kids with the culture and ecology of the Flint Hills. See page 15 for details! 9:30am-12:00pm	July 6	Sunset Zoo Go Behind the Science at this family-friendly event featuring zoo staff and local scientists. Enjoy hands-on, interactive experiences to explore the work happening in our backyard. Included in zoo admission. 9:30am-5:00pm	July 7	Sunset Zoo All children visit free with a paid adult’s admission. 8:00-11:00pm	July 12	Northeast Community Park Join the Flint Hills Discovery Center as we head off-site to explore the night sky with high-powered telescopes, make fun crafts, and learn about the universe. Open to everyone. Begins 9:00am	July 13	Liner Trail Head Boat Ramp Paddle the Kansas River for this Guinness World Record breaking event! This year, we are attempting to break the world record for longest parade of canoes or kayaks. Spots are limited! Bring your own vessel or rent one of ours. Family-friendly fun! 10:00-10:30am	July 26	Manhattan Public Library Slither into reading with the Sunset Zoo and the Manhattan Public Library. See page 15 for details! 10:00am-5:00pm	July 27	Flint Hills Discovery Center Dust off your boots, grab your hat, and gather the family it’s time to celebrate the American Cowboy at the Flint Hills Discovery Center. General admission rates apply. 12:00-12:10pm	Fridays in July Blue Earth Plaza Pavilion Enjoy a 10-minute science demonstration from the Flint Hills Discovery Center education team while you picnic and splash! Free, offered every Friday, and registration is not required. 10:30-11:00am	August 2	Flint Hills Discovery Center Unique stories connecting kids with the culture and ecology of the Flint Hills. See page 15 for details! 1:00-5:00pm	August 11	City Park Waterpark Bring your furry friends to cool off at the pool on the last day of the swimming season! Admission is (suggested) $2 donation to benefit the T. Russell Reitz Animal Shelter. 10:00am-5:00pm	August 24	Flint Hills Discovery Center Explore the Renaissance world of Leonardo Da Vinci with music, performers, crafts, and science experiments! Regular admission rates apply. 12:00-4:30pm	August 3	Sunset Zoo Enjoy a Water Safari through Sunset Zoo, featuring a zoo full of activities with Konza Rotary’s Water Matters Day. Children visit free with a paid adult’s admission. 8:00am-1:30pm	August 10 Flint Hills Discovery Center Get a behind the scenes tour of the Jeffrey Energy Center and K-State Nuclear Reactor. See page 21 for details! 7:00am & 9:30am August 10	City Park Calling all kids and adults! Challenge yourself by participating in a triathlon - give it a TRI! Adults: 400 meter swim, 12 mile bike, 5K run (start time of 7 a.m.) Youth: 50 yard swim, 2.4 mile bike, half-mile run (start time of 9:30 a.m.) All activities will take place in and around Manhattan City Park. Youth ages 5-14. Beginning 3:00pm	August 24	Sunset Zoo A fundraiser in support of Sunset Zoo. Enjoy a casual evening of great beer, food, and music. Tickets go on sale Monday, July 15 at noon! Special zoo hours on this day for event setup: 9:30am-12:00pm. Times Vary by Facility August 25-31 Kick off the start to another Wildcat football season with Sunset Zoo and the Flint Hills Discovery Center. KSU faculty, staff, and students receive discounted admission to both facilities the entire week! 12:00-12:10pm	August 2 & 9	Blue Earth Plaza Pavilion Enjoy a 10-minute science demonstration from the Flint Hills Discovery Center education team while you picnic and splash! Free and registration is not required. 10:30-11:00am	September 6	Flint Hills Discovery Center Unique stories connecting kids with the culture and ecology of the Flint Hills. See page 15 for details! 6:00-7:30pm	September 6	Wefald Pavilion	Celebrate the end of summer and the completion of the 101 Days of Summer Passport with a family-friendly BBQ in City Park! Manhattan Parks and Recreation and Fort Riley Outdoor Rec are partnering to bring this fabulous event together for the community. Games and food for everyone. Donâ&#x20AC;&#x2122;t forget to bring your completed Passport for a chance to win prizes! 9:30am-5:00pm	September 8	Sunset Zoo Special admission for grandparents from 9:30am-5:00pm; family-friendly activities from 12:00-4:00pm. Enrichment Day: Learn how keepers ensure the animals are active and healthy! 12:00-5:00pm	September 15	Flint Hills Discovery Center Come one, come all, as the Flint Hills Discovery Center opens its doors FREE for the entire community! 7:00pm	September 18	Tallgrass Tap House Enjoy science in a fun and engaging way with this free, interactive program. See page 21 for details! Bring your completed Family Adventure Passport for a chance to win prizes! Spend the evening with Manhattan Parks & Recreation and Fort Riley Outdoor Rec for an end-of-summer BBQ! FREE food and fun for the entire community! (City Park Only, 6-8pm daily) Adult (16+): $3 Youth (2-15): $2 Child (<2): Free All persons entering the waterparks must pay an admission fee. Non-swimmers will be charged $2 admission. If you purchase 5 or more season passes in a single transaction, you can receive a 20% discount on your purchase. RENTALS Rent the Northview Waterpark for your event or club! Available June 1 to July 31. Reservations accepted beginning May 1. No times available Tuesdays. Fees: $200/1.5 hour. No rentals of splash parks. Swim America is a national, goal-driven and technique-oriented learn-to-swim program. Sessions run Monday-Thursday for two weeks. Average class size is 6 swimmers per coach. Preschool participants must be 3 years old before the first class and must be accompanied by an adult in the water. Participants must attend the time and location of the session they are registered for. PRIVATE LESSONS Private lessons offer one-on-one instruction for swimmers of all ages (3+) and abilities. Classes take place on Saturday mornings at 10:00am and are 40 minutes long. The cost is $25 per class; June 15 through July 27. BODY WAVES Enjoy how the water provides resistance for a total body workout. Several options available over two sessions. A great way to start your day. Low-impact moves with added resistance from the water. Several options available. Discount pricing for multiple aerobics session sign-upâ&#x20AC;&#x2122;s. Please contact our office for details! through September 2 Passes are good at all three waterparks during regular business hours! Available at the Parks & Recreation office or may be purchased by phone. We are committed to providing exciting camper experiences with an emphasis on safety, convenience, and education in a fun setting. All staff hired have received a criminal background check and follow safety procedures such as daily check-in and check-out of participants. Enrollment is accepted on a first-come, first-served basis for all camps, and campers will receive a confirmation of enrollment by email. Each campsite has specific paperwork that must be completed prior to attendance. Please note the refund policy that is specific to EACH PROGRAM at the time of registration. A non-refundable $20 deposit will be held for each enrolled camp session. A full refund is provided (less the deposit) if registration canceled prior to one week of start date. Partial refund is given (less the deposit) if canceled between one week and 48 hours prior to start date. No refund given if canceled within 48 hours. ANIMAL CRACKERS CAMP High-energy activities interspersed with downtime every day. Live animal interactions, Zoo tours, crafts, games, and story times, all part of the mix! SUMMER SAFARI CAMP Campers will connect with the natural world through activities including crafts, stories, games, live animal interactions, projects, Zoo tours, and nature hikes. WEEKLY OPTIONS NATURE NAVIGATORS CAMP Campers will explore their surroundings through nature hikes, Zoo tours, science-based projects, group games, live animal encounters, and field trips. Bees, Butterflies, & Birds Oh my! DAILY OPTIONS Experience the Flint Hills and the world like never before! Choose a half or full-day session. Many programs will focus on STEM - Science, Technology, Engineering, and Mathematics - as they apply to the Flint Hills. Registration includes snacks, supplies for activities, and access to exhibits. Full-day registrants must bring a sack lunch. Permission forms are required for participation and available online at flinthillsdiscovery.org/Summer. Kids who have completed kindergarten through 7th grade as of May 2019 will enjoy a summer full of arts, crafts, games, swimming, special events and excursions at this KDHE-licensed day camp. Snacks are provided, and lunch is provided by USD 383. Attendees may take swimming lessons for an additional fee. Learn more at MHKPRD. com/LADC. Session Fee Session 1 (Jun 3-28): $510 & Dates: Mini Session (Jul 1-5, excluding July 4): $102 Session 2 (Jul 8-Aug 2): $510 Trips, activity fees, snacks and lunch included. Sign up for one, two or all three! Fun in the Sun: Water Day! SUMMER THEATRE ACADEMY & YOUTH MUSICAL is an all NEW collaborative full-day theater camp program with Manhattan Parks & Rec and the K-State School of Music, Theater, & Dance! Morning theater classes are taught by K-State faculty, staff and students; afternoons include rehearsals and participation in all aspects of theater production. This theater academy is centered on the creativity of the participants! Participants in the second session will audition to take part in the live theater performance. Tallgrass Tales is a unique program that uses storytelling to connect the youngest residents of our community to the rich culture and ecology of the Flint Hills. Each session is the first Friday of the month and features a different story supported by themed programming. Registration not required. Help your child explore the natural world. Animal-themed classes will include a craft, animal visitor, and Zoo tour. Classes go outside; dress accordingly. Preregistration required. Parents/guardians required to attend class with youth. Slither into reading with the Sunset Zoo and the Manhattan Public Library every fourth Friday of the month. Each month features a different animal story and unique animal artifacts. Some storytimes feature live animals or a craft! This is a free program and preregistration is not required. Beginning Ballet places emphasis on technique, barre work, and choreography, as well as ballet vocabulary. Students will develop and improve their poise, flexibility, grace, self-discipline, and posture. Ballet slippers are required. BEGINNING HIP HOP BEGINNING TAP Beginning Tap introduces students to basic steps of tap. Wear tap shoes. Beginning Hip Hop introduces students to the basic concepts, techniques, and choreography of hip hop dance and culture. READING ACROSS KANSAS FREE remedial and enrichment work in reading and languge arts for students leaving K-6th grade. FREE remedial and enrichment work in math skills and concepts for students K-8th grade. Limited to 24 students with teacher recommendation. YOUTH ART 2D ART Learn several 2-dimensional art forms such as drawing, painting, printmaking, and collage. Materials provided! Work together as a team with your older kiddos to create unique and creative pieces using basic pottery techniques! Learn to create stamps, reliefs, lino cuts and other prints for use in artwork. Materials provided. PAINTING Learn basic painting techniques using water-based media. Materials provided. Learn basic hand-building techniques as well as glazing your clay art to take home. Tiny Tumblers is an introductory gymnastics class taught on Saturdays by certified instructor Tiffany Cook. An hour of fun practices, games, and friendly competition. Learn the game, make friends and practice skills. Squads practice and cheer at the Flag Football games. Games begin September 9th. LITTLE VOLLEY ACADEMY One week basic skills clinic taught by former Virginia Tech volleyball player, Annie Cook. Knee pads recommended! FALL SOCCER Fall soccer encourages young children to be active while developing basic soccer skills. Games are played Monday through Thursday evenings at varying local parks. Games begins September 9th. Shin guards required! TENNIS CLINIC A great way for children to receive an introduction or continue tennis skill development through USTA Quick Start Tennis. Instructed by Body First. New program offered to freshmanseniors during the 2018-19 school year. Register individually and MPRD will form rosters; coaches needed to help with organization of team and communication with other parents and MPRD staff. Teams play every Tuesday & Thursday for a total of six games. Manhattan native, M.L. Latimore, is MPRD’s summer spotlight coach. For the last three years, Mr. Latimore has coached five different youth sports - baseball, t-ball, basketball, soccer, and flag football. Thank you, M.L., for all you do for the Manhattan Parks & Recreation Department, and for the youth in our city! Secrets of Tuttle Creek: Get behind the scenes access to Tuttle Creek dam, tower, and spillway from the Army Corps of Engineers! WOLF SPIDER NIGHT WALK See and handle real spiders, then head out on a night walk with a headlamp to find, catch, and release wolf spiders. Creepy, crawly fun for the entire family! Two dates available; preregistration is required. Secrets of Manhattan: See how Manhattan works with behind the scenes tours of the MHK Airport and water treatment facilities. Secrets of Energy: Get a behind the scenes tour with Jeffrey Energy Center and K-State Nuclear Reactor. Enjoy science in a fun and engaging way with this free, interactive program presented by Sunset Zoo at Manhattanâ&#x20AC;&#x2122;s Tallgrass Tap House. Program starts at 7pm; arrive early to grab dinner and drinks. This event is part of Sunset Zooâ&#x20AC;&#x2122;s Behind the Science initiative. Fitness & Physical Activity A great way to get active! At the Douglass Center, we have a little bit of everything: strength training, dance fitness, and mind/body yoga classes. Personal training available. Call 785-587-2773 or visit the Douglass Center at 900 Yuma Street for more information. BASKETBALL OPEN GYM BEGINNING MAY 28! YOGA FLOW Find a connection with your breath and movement using various postures to strengthen and stretch your body and refocus your mind. Monday - Wednesday 1:00-5:00pm Thursday - Friday 1:00-7:00pm Saturday 12:00-4:00pm Sunday Closed PERSONAL TRAINING One-on-one training with a certified trainer to help reach your fitness goals. For more info contact Mitzie Rojas rojas@cityofmhk.com or call 785-5872773. The Arthritis Foundationâ&#x20AC;&#x2122;s exercise program is walking and movement that can reduce pain and improve overall health. A fun sport combining elements of tennis, badminton, and ping-pong. The rules are simple and the game is easy. Great for all skill levels! FITNESS WITH ENELL Fitness and flexibility training program for older adults wanting to achieve a better quality of life through responsible, pain-free movement. All performances take place at the Larry Norvell Band Shell in City Park, unless otherwise stated. We offer an extensive program for our special needs populations! 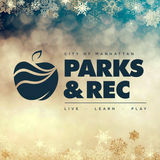 The registration form for all Special Communities programming is available at MHKPRD.com or at the Parks and Recreation office. Inquire about our Special Communities Activity Guide to receive more information on monthly special events. Questions? Contact zachary.bayless@cityofmhk.com or 785-587-2766. Register online with activity #240124 (adults) and #240125 (youth). Cooking classes are hands-on and teach skills in basic preparation of healthy, budget friendly recipes. Each month recipes will follow a theme! The goal for the 2019 gardening season? To spend as much time outside as we can! Weekly enrollment available on Saturday. Weekly, we offer craft choices, a coloring table, and a specialty arts table. Specialty arts include yarn art, ceramics/pottery, water color painting, and sewing. ADAPTIVE DANCE We are excited to partner with No Stone Unturned to offer this exciting, new program! The goal of this class is to provide children with a wide range of special needs the means to express themselves through dance while improving gross motor skills, social interactions, sensory regulation, and visual/auditory processing. This class is for all skill and mobility levels; dances are designed for each childâ&#x20AC;&#x2122;s skill. BOWLING BLAST Join in the bowling fun with family and friends every Tuesday! We will offer gym sports, Uno games, puzzles, coloring, and line dancing. You can also sit, relax and visit with friends. FREE for adults and youth! Want real world experience to add to your resume? Junior camp leaders will train side-by-side with our summer education staff. They will learn valuable leadership, communication, and teamwork skills assisting in themed summer camp and special event programming. Youth and parents must attend a required April orientation session before applying. Training is the last week of May and youth serve June through August. $50 registration fee applies to accepted applicants. More info online at www.flinthillsdiscovery.org/volunteer Mandatory orientation takes place April 6th, from 1:00-2:00pm at the Flint Hills Discovery Center. Join the T. Russell Reitz Animal Shelter on April 20th, from 1:00-5:00pm for an afternoon of furry friends! Go behind the scenes, check out our facility, and meet the staff. Enjoy refreshments, and say hello to our adoptable pets! THANK YOU TO OUR SPONSORS Manhattan Parks and Recreation would like to offer our deepest appreciation to the businesses you see below. Their financial investment in our Special Events programs makes what we do for our community possible. Thank you to our 2018 sponsors! If your company or organization is interested in sponsorship opportunities with MHKPRD, please contact 785-587-2757. FALL PREVIEW WINTER Ice Skating Adventure Camps Glow Paddle Punt, Pass, Kick Red Cedar Holiday Harvest First Day Hike Youth Winter Sports & Clinics Adult Sports Tournaments ATV Excursions Hot Shot Basketball Gym Buddies New exhibits And much MORE!